Don't be turned off by Windows 10 S and the Pentium chip inside it. We were pleasantly surprised by how well Microsoft's Surface Go works, save for the keyboard. The Windows 10 S, mess? Microsoft’s 10-inch, $399 Surface Go tablet is a departure from the company’s Surface tradition, which put forth expensive, ambitious designs to break trail for the rest of the PC industry. 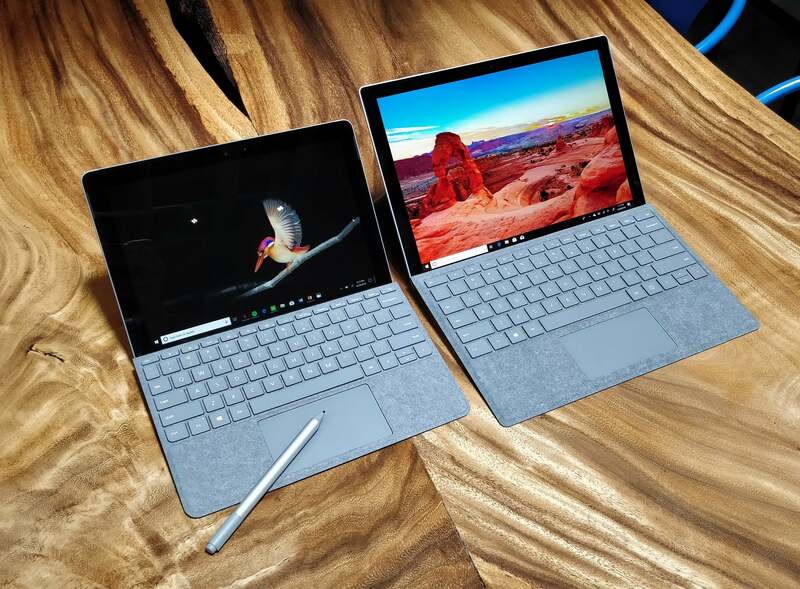 Now, the Surface Go’s decidedly mainstream price should appeal to businesspeople on the go as well as consumers considering an Apple iPad or Android tablet. Caveats like its operating system—Windows 10 in S Mode—and its low-end processor may give you pause. 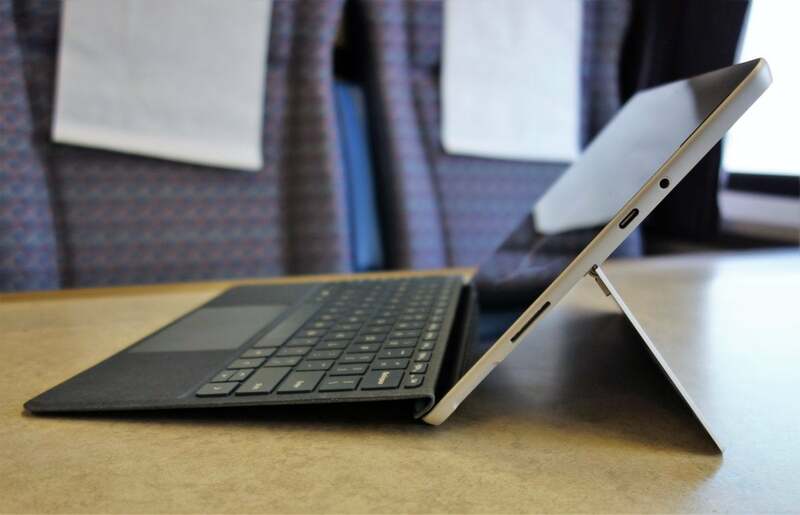 And the optional but cramped Type Cover somewhat offsets the Surface Go’s convenience. But our Surface Go review will walk you through the Surface Go hardware, the Type Cover, and the new Mobile Mouse—then tell you how it all works in practice, both as a pure tablet and as a productivity device. Finally, we’ll talk about the Surface Go’s performance, and how it compares to PCs and other tablets both under Windows 10 in S Mode and Windows 10 Home. 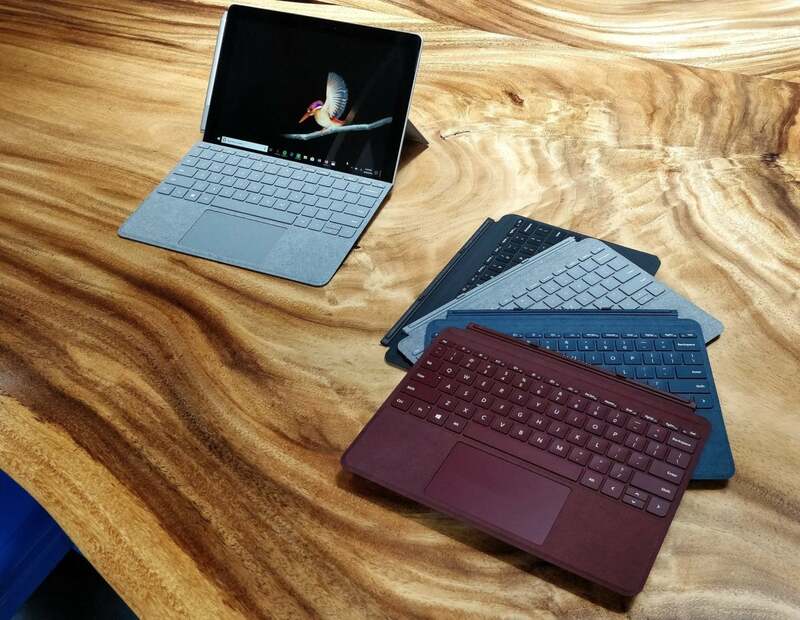 Microsoft offers a choice of four different colors of Type Cover keyboards for the Surface Go. 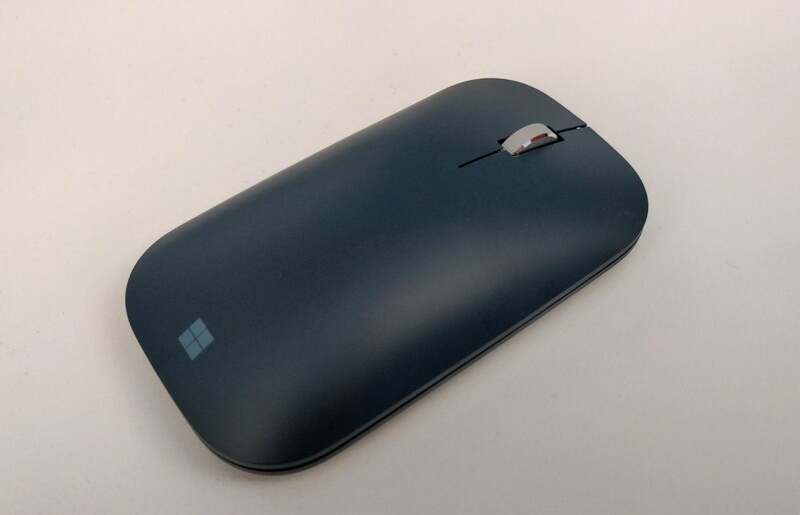 The new Mobile Mouse is color-coordinated as well. Storage: 64GB eMMC/128GB SSD (128GB as tested). A commercial model with 256GB SSD is planned. Price: 4GB RAM/64GB storage: $399Remove non-product link; 4GB RAM/128GB storage: $499Remove non-product link; 8GB RAM/128GB: $549(via the Microsoft Store). Costco offers its own bundle with 4GB of RAM, 128GB SSD, and a Type Cover for $550. Out of the box, the Surface Go feels light and sturdy, if a tiny bit chunky. Microsoft’s hardware gurus crafted the Surface Go out of the same magnesium compound of previous iterations, with Gorilla Glass 3 protecting the 10-inch PixelSense display. While the Go doesn't offer the various display color options of the Surface Pro (2017) or Surface Book, the 1800 x 1200 (3:2) display is consistent with other Surface aspect ratios and pumps out a surprisingly bright 397 nits of light. What normally would be a USB-A slot on the side of a Surface has been replaced by a USB-C connector. It’s a bit hard to believe that the Surface Go is actually the ninth Surface tablet, with three Surface and Surface Pro predecessors, respectively, plus the Surface RT and a “reimagined” Surface Pro (2017). The Go retains many familiar elements: the power and volume rocker on the top, the microSD slot under the kickstand, and the MagSafe-like Surface Connector on the right side. There, you’ll also find the headphone jack, and I/O port—which has migrated from USB-A to USB-C with the Go. The Surface Connector still works with the Surface Dock, as well as a growing number of USB-C hubs. Microsoft designed the Surface Go to be able to work comfortably on the go. 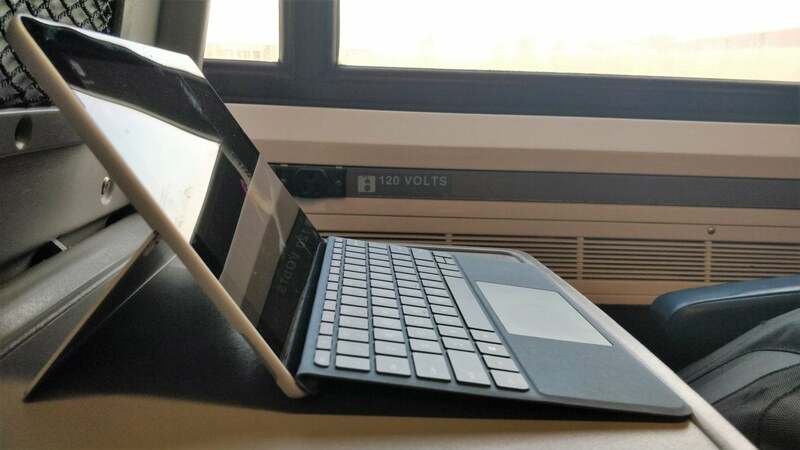 Here’s a Surface Go in action on the Bay Area’s Capitol Corridor commuter train. You can thank the low-end Pentium chip for two other features: The total lack of fan vents and the low-power charger. Unless heat is somehow pushed out of the I/O ports—which, to my finger, it is not—the Surface Go is entirely passively cooled. Under load, the upper third of the Go warmed up, but not unpleasantly. The 1.6-amp charger is modestly endowed compared to the the 3-amp to 4-amp rapid phone chargers you see these days, so you can probably charge your Surface Go using your phone’s USB-C charger. We say “probably” because Microsoft didn’t provide details on the USB-C port’s capabilities, so we tried it out. While the port clearly doesn’t feature Thunderbolt, it slow-charged a connected phone. We weren’t able to charge the tablet with a OnePlus rapid charger (5V, 4A), but a 5V/2A external battery charger did the trick. As we talk about the Surface Go experience later in our review, you’ll note we make the case for using the Go without its Signature Type Cover. In part, that’s because the Type Cover experience is a step down from generations past. Aesthetically, these new Signature Type Covers boast the same, slightly plush Alcantara fabric that’s lived on the outside of the last few generations, which give way to a slightly smoother, plasticky feel along the inside. The Type Cover grips the Go tablet using the same double hinge of past Surfaces, plus what appears to be an even stronger magnetic connection at the edge. You really have to give the Type Cover a yank to separate it from the tablet, which helps cement its place on your lap. The Surface Go’s smaller size means its Type Cover is smaller, too. 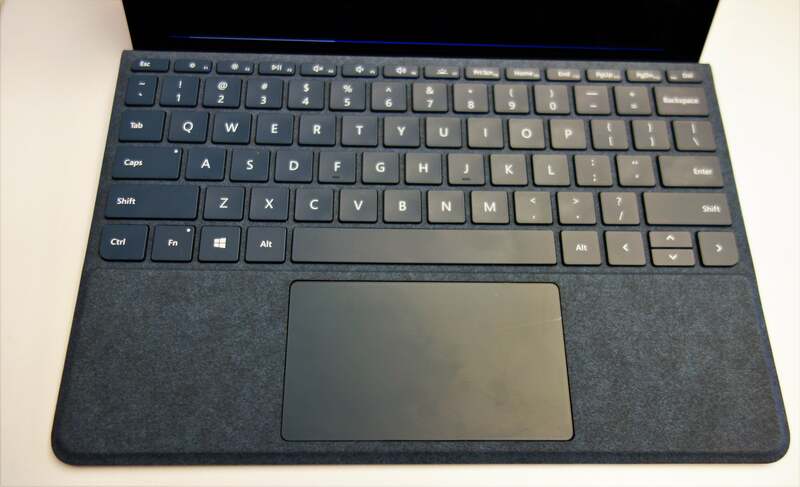 Microsoft claims the keyboard is about 85 percent the size of the Surface Pro’s. The keys are visibly smaller compared to their counterparts on other Surface keyboards—notably the Enter key, plus the relatively tiny function keys. 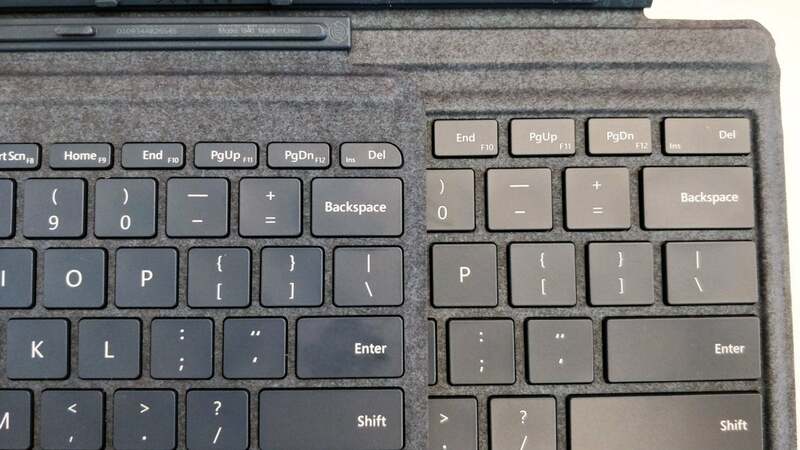 ...but you can see, if you overlap the standard Type Cover (right) with the one that ships with the Surface Go (left), that the keys are smaller. While Microsoft generally made smart sizing choices, the Surface Go’s Type Cover is likely to be uncomfortable for users with larger hands. My hands are average-sized, and they began to cramp after a period of typing. Typing on the Surface Go is a mixed bag in other ways. 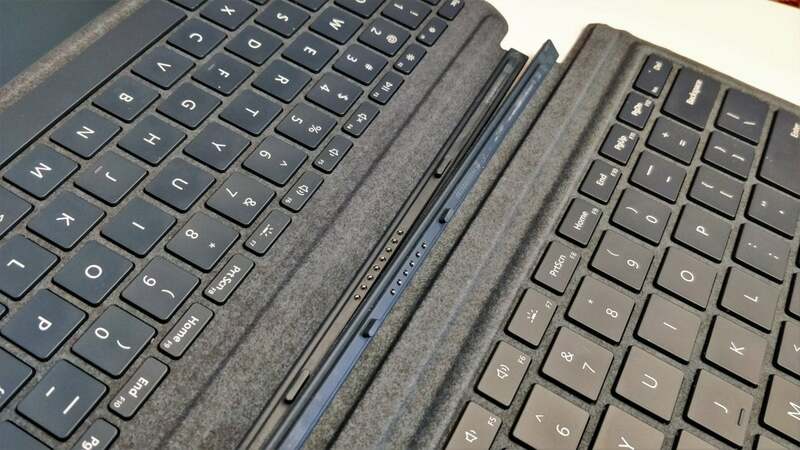 On paper, the most eye-raising change is the key travel: 1mm, versus the 1.3mm key travel on previous Surface Pro Type Covers and about 1.5mm for the typical laptop. Surprisingly, the reduced key travel didn’t bother me as much as I though it would—a firm response cushions your fingers as they land. There’s a surprisingly small amount of keyboard flex, too. As you strike the keys, however, they produce a noticeably hollow, woodblock sound. The keys include three levels of backlighting (which Apple’s iPad left out of its accompanying Smart Keyboard, incidentally). The Surface Go can be fully reclined, and is also compatible with the Surface Dial. I’d rate the trackpad, which is ever so slightly smaller than the Surface Pro (2017)’s, as a slight step down as well. There’s a plasticky feel to it, and it’s responsive only over the lower three-quarters or so, not its entirety. It’s not quite up to previous Surface standards. Want to use an older, larger Type Cover with the Go? No can do—note the difference in the width between the small pegs that marry the keyboard with the tablet. 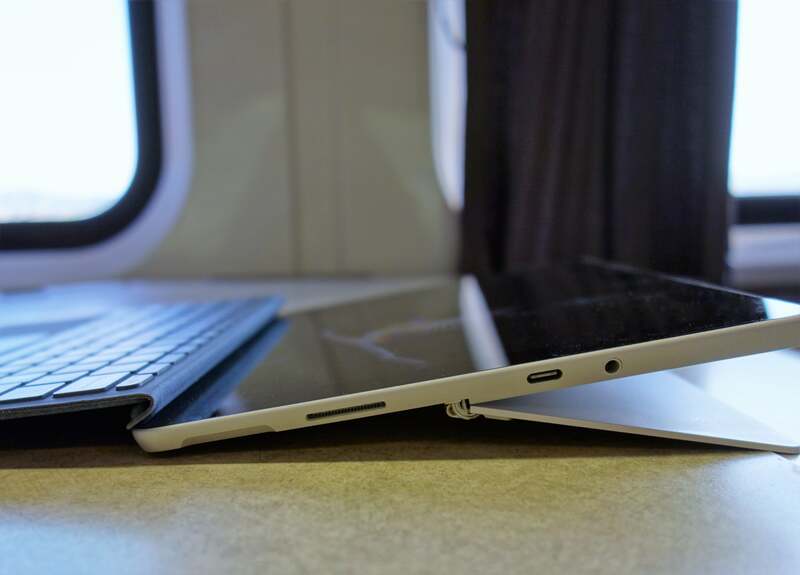 One of the Surface 3’s highlights was its unexpectedly strident audio. The Surface Go takes it down a notch or two, but it provides enough oomph to play a few Spotify tracks while you’re washing the night’s dishes. I found the audio surprisingly balanced, though unsurprisingly lacking in low-end bass. Headphones, of course, provide a fuller, richer sound via the headphone jack. We didn’t test the rear camera, but the front camera logged us in consistently via Microsoft Hello. You’ll probably prefer the feel of your desk mouse over the Surface Mobile Mouse, but its low profile makes it conducive to traveling. While I’m not a fan of flat mice, the extremely slick way in which this one glides across the surface of a mousepad feels great. 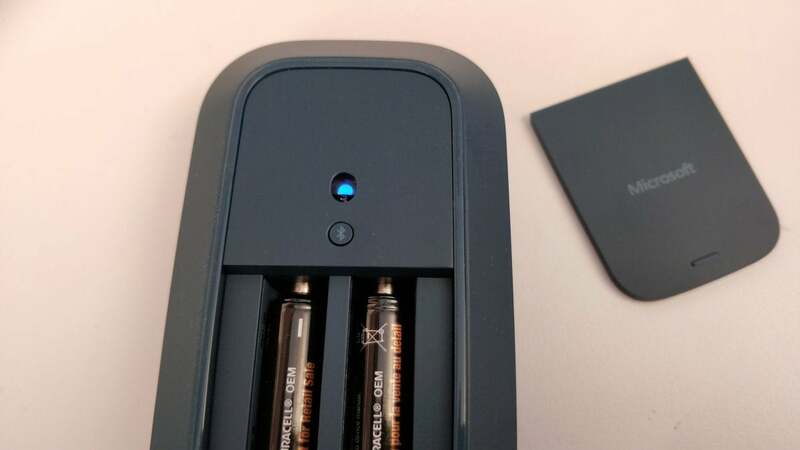 There’s even something to love within the battery compartment, which features a magnetic connection and spring-loaded battery connections. Though the batteries popped out easily when I accidentally dropped it, it’s otherwise very satisfying, aesthetically. The magnetic clasp and spring-loaded battery connectors are a nice engineering touch, though we wonder whether the battery compartment will pop open under repeated storage within a laptop bag or backpack. By now, a certain percentage of the PC-using world—heck, even a certain percentage of PCWorld—sees “Windows 10 S” and stalks off in disgust. 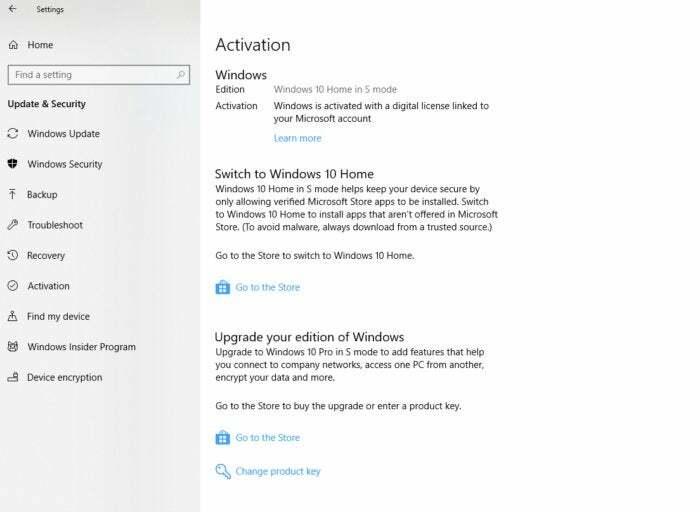 Windows 10 in S Mode restricts you to apps found within the Microsoft Store, which include a mix of games and productivity apps that are usually far less comprehensive than what you’ll find within Apple’s iOS app store or Google Play. You’ll also lack the opportunity to access the Command Line and some other Windows utilities, though Edge plug-ins now work. The Surface Go’s Settings menu provides a way out of Windows 10 with S Mode, if that’s what you prefer. 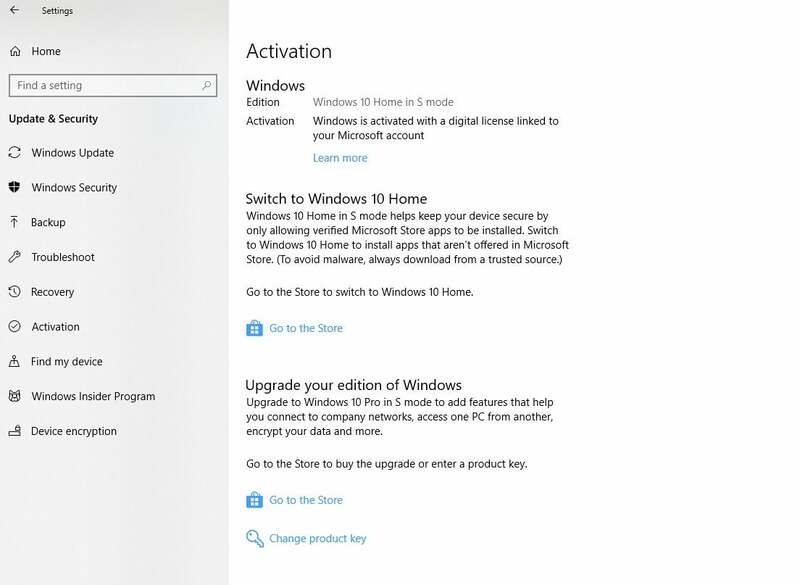 But if that’s simply too restrictive, Windows offers a one-time, free “switch” out to Windows 10 Home, giving you unlimited freedom of choice in apps, as well as a one-time free “upgrade” to Windows 10 Pro in S Mode, which leaves the app restrictions in place but allows you to connect to company networks. Windows doesn’t attach any time restrictions to the switch or upgrade. The Switch simply requires you to go to Settings > Update & Security > Activation and select which one you prefer. After testing in Windows 10 S, we switched to Windows 10 Home, and the process was quick: By the time we turned back to check on it, it was done. While there’s some truth in bemoaning the lack of choice in Windows 10 S, the Surface Go also does some positive things with S Mode that are worth noting. During setup, Windows asked for my Microsoft account. But it also noticed that I already had an Office 365 account attached to it, and offered to set it up. The first time I loaded Microsoft Word, my documents that were backed up within OneDrive loaded automatically, and Windows offered to set up the rest of the Office apps in the background. Very convenient. But OneDrive is also integrated within Windows 10 in S Mode, and that makes a great deal of difference. Every file that I had previously stored in the OneDrive cloud over the past few years automatically appeared in the appropriate folder—the documents stored in my OneDrive Documents folder re-appeared in my local Documents folder, as a OneDrive placeholder. That meant that I could see every file that I had backed up as if it were on my machine—but without burdening my storage capacity. Every screenshot I took and stored within my Pictures folder also automatically backed up to the cloud. That is how cloud storage should work. 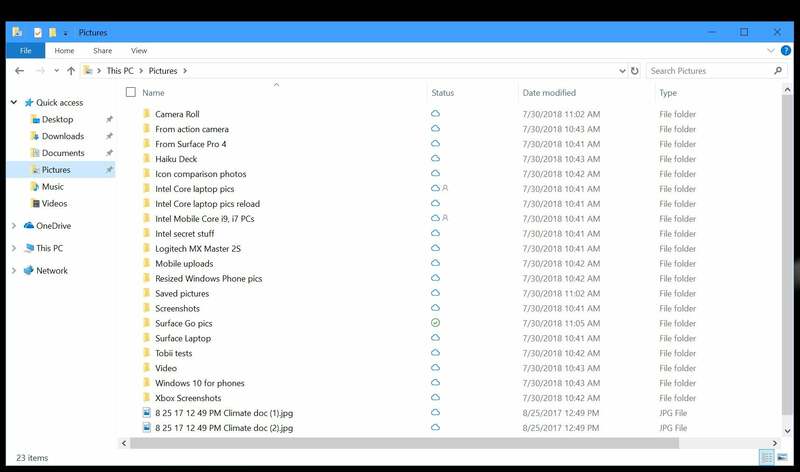 Most Windows 10 implementations seem to have a dedicated OneDrive folder. The Surface Go and Windows 10 S mixes all of your cloud and local storage in one place. Well, mostly. Copying a multi-gigabyte file over a USB drive onto the Go also kicked off OneDrive, and it started syncing it in the cloud. Since I couldn’t find any right-click option or OneDrive setting to halt syncing for this particular file, I paused syncing. That’s not what I wanted. Does that mean you can get by with a Surface Go with only 64GB of storage, as opposed to 128GB? Maybe, maybe not. Smaller, personal files that you’d create on a Go will probably be documents, whose size generally range in the megabytes. It’s the larger apps that will chew up space quickly. Another reason to consider the 128GB option: It’s a fast SSD, versus the slower (and cheaper) eMMC storage used for the 64GB version. So far, the Go looks and feels like a smaller, yet conventional Surface device. But with the Go, Microsoft implicitly asks a question: Do you really need a Type Cover? With previous iterations of the Surface, the question was a bit ridiculous, if not rhetorical: Of course! They were built for productivity. Also, once you’ve shelled out, say, $799 or more for the Surface Pro (2017), adding a $160 Signature Type Cover isn’t much more of an investment. With the $399 Surface Go, adding the Go’s $99 Signature Type Cover in black (or $129 for Type Covers in cobalt blue, burgundy or platinum) adds a proportionally larger chunk to the total cost. But it’s about more than the money. The Surface Go’s rather wide bezel (about 0.63 inches) gives a thumb and forefinger plenty of room to grasp the tablet—which is good, because Windows doesn’t seem to be smart enough to tune out a thumb that wanders onto the display itself. My average-sized hands were just wide enough to straddle the Go with my fingers spread out, so I could use it either as a “one-handed” tablet, pecking at the screen, or as a massive phone of sorts, jabbing at it with my thumbs. Microsoft's new, affordably priced 10-inch tablet runs Windows 10 S for a streamlined Windows experience. It doesn't have great performance, but it provides a "real" computer when you need it.